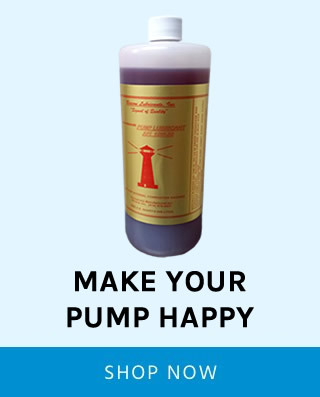 Downstream injection introduces chemical into the system after the pump, so no chemical is ran through the pressure washer pump itself. A downstream injector works by maintaining a certain PSI on the pump side of the injector by means of an orifice installed into the injector body. When the PSI drops by at least a 30% differential on the outlet side of the injector it creates a vacuum draw that pulls your pre-mixed chemical solution into the injector body and mixes it with the flow of water traveling through the injector and out the hose and gun assembly of the pressure washer. 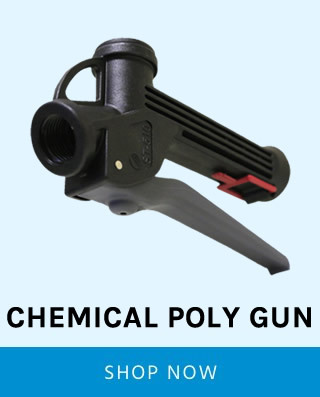 The pressure washing industry rates injectors by the GPM of the pressure washing system. These ratings are 2-3, 3-5 & 5-8 GPM. In theory this rating system works for pressure washers using about 100' of hose. This is where the industry's system starts to get fuzzy. You lose 1 psi of pressure per 1' of hose in a typical pressure washing system. So even though in theory if you have a certain pressure drop with a given orifice size, they do not take into consideration that the pressure drop that happens in the hose creates a back pressure that increases the PSI on the outlet side of the injector. So the more hose you run on the system can create enough back pressure to make the pressure differential drop out of the 30% range causing the injector not to draw. This situation becomes more prevalent when the GPM of the pressure washer is at the injector's beginning GPM (i.e. 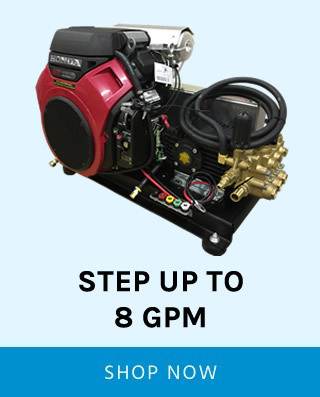 : 5 GPM pressure washer using a 5-8 rated injector). In this situation it is best to use a 3-5 GPM rated injector. The pressure drop in the hose that draws your pre-mixed chemical solution is created by changing your pressure washer's nozzle to a large orifice nozzle (aka a soaper nozzle). A #40 orifice size nozzle or larger is enough of an increase in size for pressure washers up to 8 GPM to draw chemical. 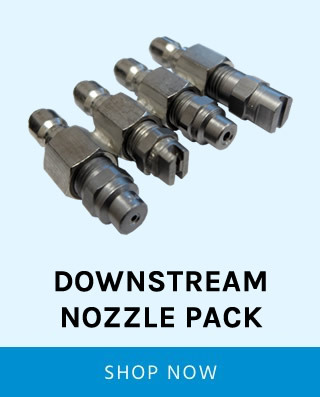 All nozzles come in 4 standard patterns: 0, 15, 25, and 40 degree. The 0040 (0 degree #40 orifice) is a handy nozzle to apply chemical to surfaces up high and a 2540 (25 degree #40) would be used for lower chemical application. 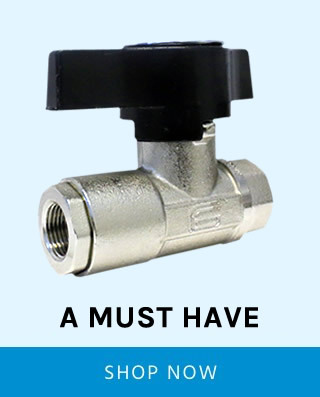 After soaping the substrate pressure washing contractors will often quick connect a smaller orifice nozzle to raise the line pressure to stop the injector from pulling soap. When cleaning a surface like vinyl siding where the use of high pressure is not needed and can often cause damage, the best policy is to just raise the pressure enough with the correct size nozzle to barely bring the injector out of it's pull range. For instance lets imagine you are cleaning a vinyl sided home that is two stories tall. 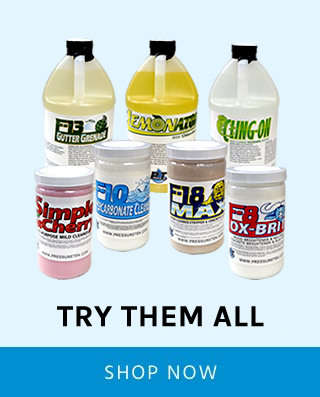 You would need a nozzle to apply your chemical low and high, also rinse high and low. I phrased it this way because you are always supposed to soap from the bottom up and rinse from the top down. For example we will use a 4 GPM pressure washer. You would need these 4 nozzles: 0040 (soap high), 2540 (soap low), 0010 (rinse high) and 2510 (rinse low). These can be tweaked for larger GPM units and for personal preferences. We have found a handy way of storing these nozzles for easy access is to use one of our four way nozzle holders. Which is four ¼ FPT stainless steel plugs that we tig weld into a row. Then you simply screw your four ¼ meg nozzles into the holder and the other three that are not in use are conveniently located at the end of your lance in line to be used next.